RANGOON — Threatening to ignite nationwide protests, the Buddhist ultra-nationalist group known by the Burmese acronym “Ma Ba Tha” has called for action to be taken by the country’s leadership against the Rangoon Chief Minister for his criticism of the organization. 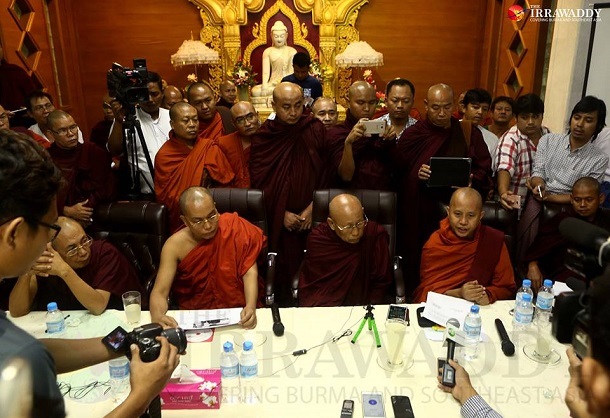 Rangoon Chief Minister Phyo Min Thein said during a meeting with the Burmese community in Singapore on Sunday that Ma Ba Tha was “not necessary” in Burma, since the country already has the Sangha Maha Nayaka Committee—the clerical council appointed by the government that oversees monastic discipline. In response to his comments, senior Ma Ba Tha leaders called an urgent meeting at their Rangoon headquarters on Thursday. The organization identified Thursday, July 14, as a deadline for the government reprimand. It also insisted that Ma Ba Tha is a lawful association, claiming that it can be classified as a “non-governmental missionary group,” while describing the Sangha Maha Nayaka as an authoritative clerical organization. When asked by The Irrawaddy to comment on Phyo Min Thein’s criticism, Wirathu said he was demanding an investigation into who is backing the Rangoon regional leader. “While other international monks’ associations from foreign countries have paid us a lot of respect and are even proud of our Ma Ba Tha, why is this Buddhist chief minister saying that the country does not need Ma Ba Tha?” he asked. Since it was founded in 2014, the group has garnered international notoriety for its hardline anti-Muslim stance, which frequently spills into hate speech. It boasts multiple branches across Burma. In 2015, Ma Ba Tha successfully lobbied for the passing of four laws imposing restrictions on religious conversion, polygamy, interfaith marriage and childbirth. Rights groups have condemned these “Protection of Race and Religion” measures as discriminating against both women and religious minorities.